Storage Performance Validation Software & Appliances: Storage load generation and I/O measurement systems that gather data and then create a production workload model using the data. The appliances can then run the emulated workload against storage systems to validate their ability to handle the workload. SolarWinds almost had a repeat of last year’s clean sweep. 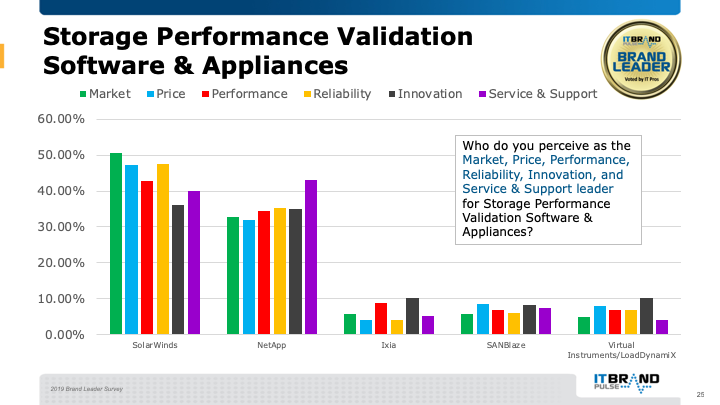 IT Pros named SolarWinds leader for five of six segments: Market, Price, Performance, Reliability, and Innovation. NetApp received Service and Support leader and was voted second for all other segments. Ixia and SANBlaze tied for the third Market slot.